Andy: You can tell just by smelling this rum that it is sold on the bottom shelf. It just smells cheap. It definitely tastes better than Bacardi Light rum, but it still isn’t good. If I were you I would spend a couple more bucks, move up a shelf and pick up a Cruzan or a Captain Morgan at least. Trust me, it isn’t worth the feeling of nauseous-ness this gives you. 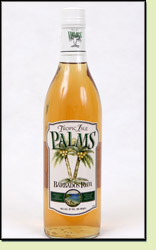 Adrian: Yeah the Tropic Isle Palms is really bad, why would someone buy this? Oh yeah, to review it. Doh! Best Spiced Rum Ever. When you open the bottle and smell it compared to Captain Morgan you can tell a big difference. First you get a whiff of the all natural spices that smell heavenly. You can tell this was made with love. Captain Morgan smells like rubbing alcohol in comparison. Makes the best Mojito’s. Smells better, tastes better. Nuff said. Cheap, mixes well and doesn’t taste bad.. Might not have to much taste but who is really drinking for taste? Not me. AND i rarely get hangovers off of this rum too, even after taking down a whole bottle..